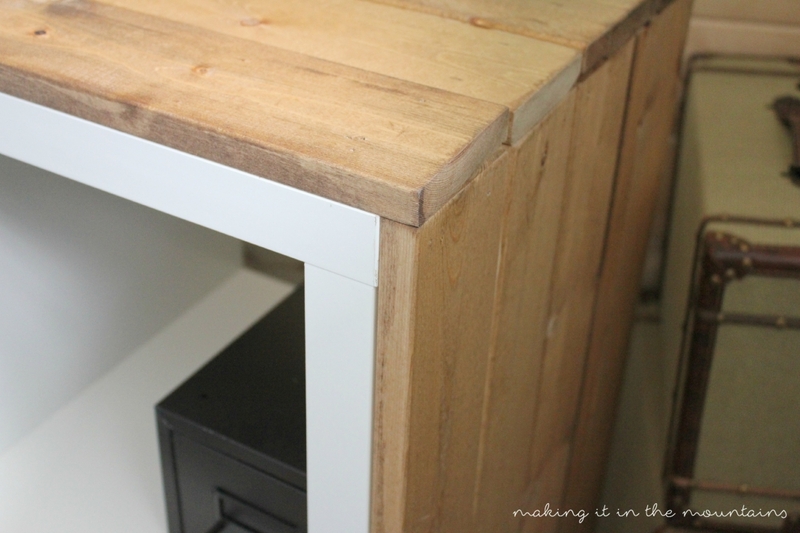 Ikea Hack: Transform A Kallax With One Simple Addition!! Hey Friends!! 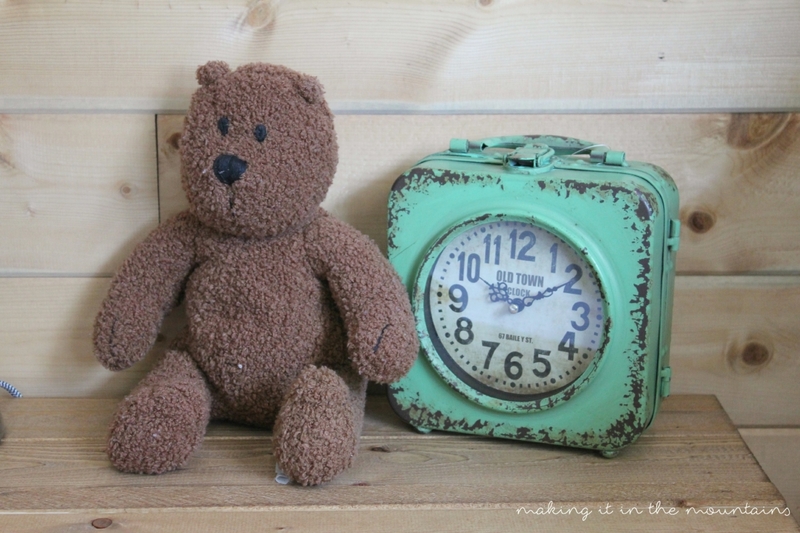 You are going to fall in LOVE with my guest poster today, Kristi!! Not only is she an amazing interior decorator with mad DIY skills (and who doesn’t love a good IKEA hack ? ), she is the NICEST person on the internet. Not even kidding. THE NICEST!! Come back every Wednesday this month to discover another talented blogger!! 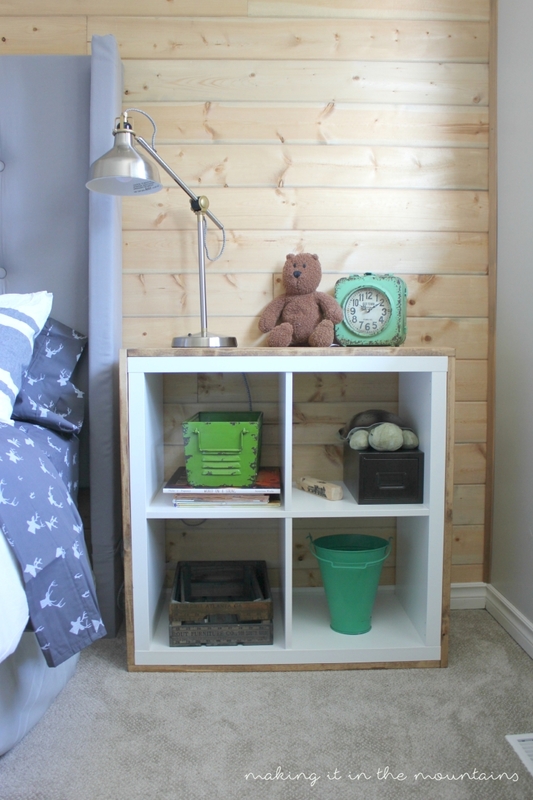 Hubs and I had an absolute blast taking part in our first One Room Challenge last spring! Taking on an entire room makeover is a BIG job, committing to get it done in just six weeks was borderline crazy! 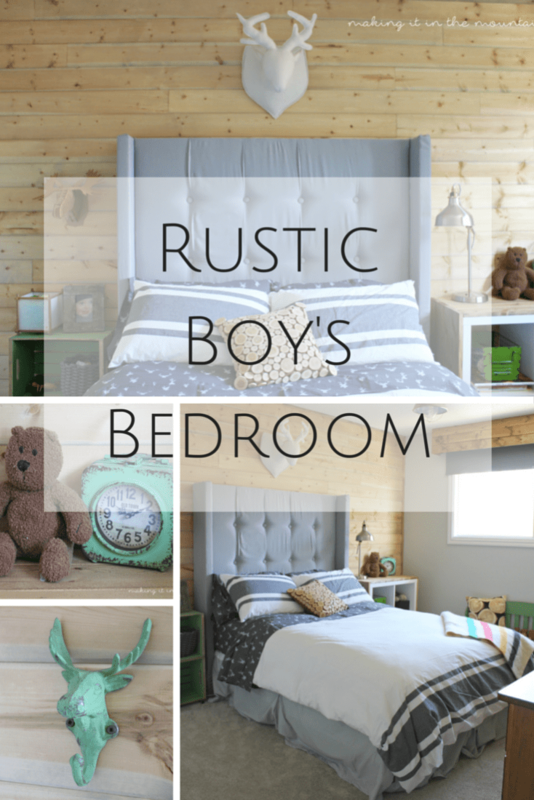 But, even through the stress and chaos, we chose to take the challenge for what it was – just the kick in the pants we needed to finally give our son his rustic big boy bedroom. 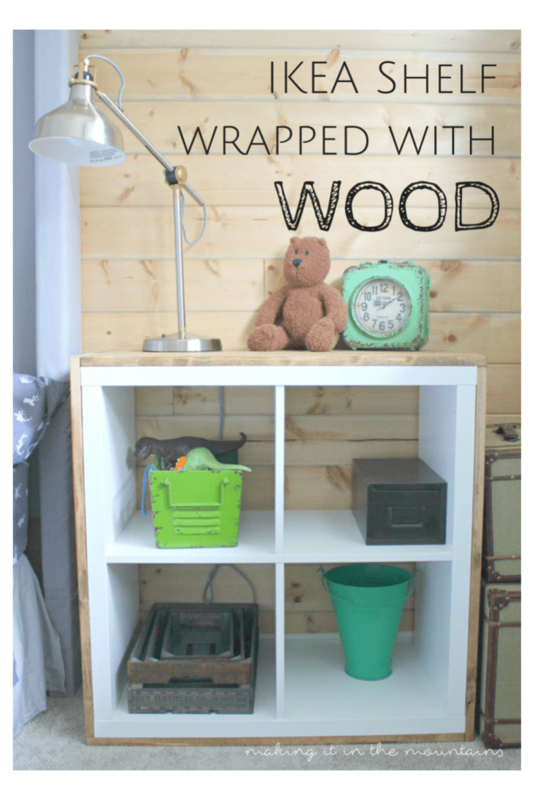 Making over an entire room meant tons of shopping, projects and DIY’ing. 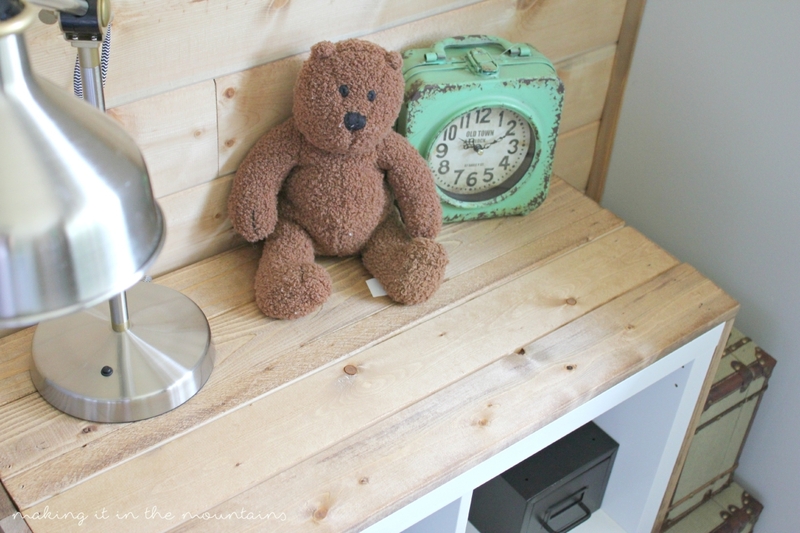 The star of the show was definitely this DIY Plank Wall with it’s perfect weathered wood finish, but I’d say a close second was the bedside table that we designed using an IKEA Kallax shelf. It really does add that polished-rustic look we were going for! 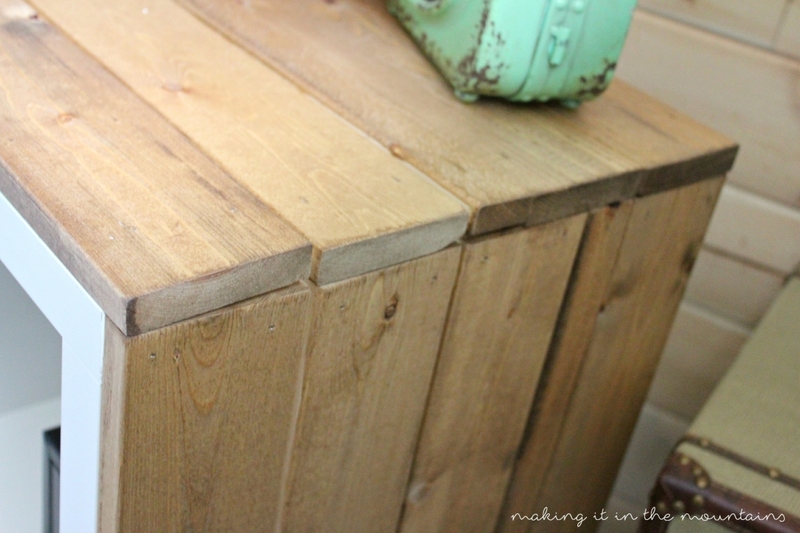 IKEA Hacks are always fun and simple, anyone can do them!! Wondering how we made it? It was easier than you think! 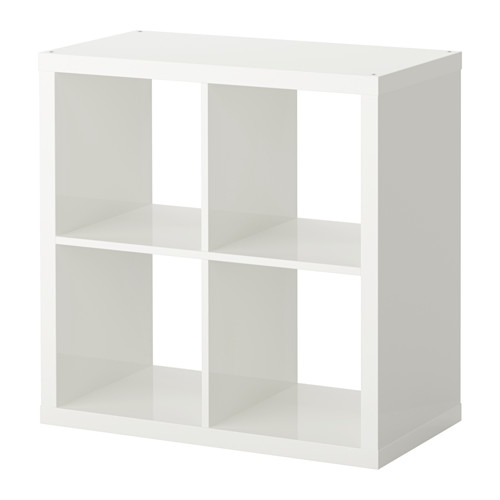 We started by putting together the IKEA shelf, which went surprisingly fast. Then, it was just a matter of “wrapping” the outside in wood. 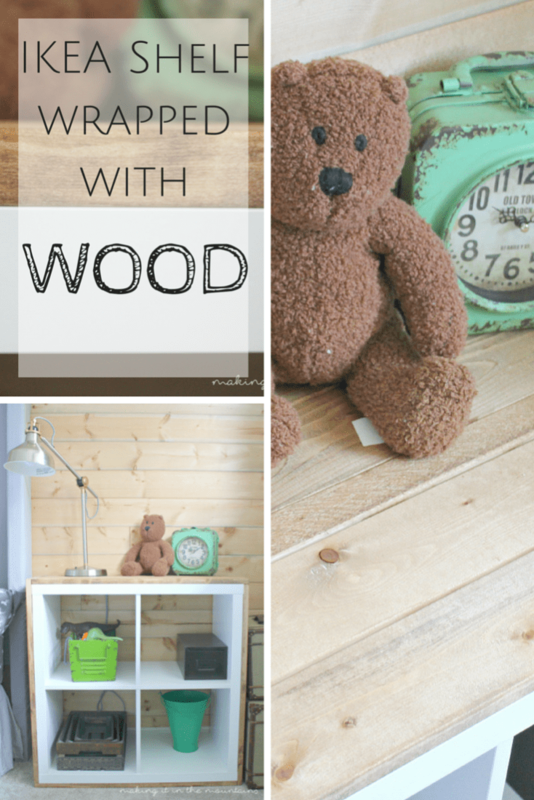 We chose to use 1×3 pine, but you could really choose to use whatever wood you’d like. *Important tip: bring your wood into the room to acclimate for a few days so that it’s at it’s truest size when you start building! You might choose to miter the boards as they meet at the corner, but in the interest of keeping things simple, we chose to match the look of the Kallax and have our boards meet with the top and bottom ends covering the edges of the boards running along the sides (see photo below). We started by cutting and nailing on the boards for both sides first, running them from end to end on both sides. Then, after measuring our new width, we added on the boards to the top and bottom, making sure to cover the edges of our new side boards (as mentioned above). The very last step was to stain the wood. I wanted a darker colour that would add some contrast with the shelf and the wood plank wall behind it, without being so dark that it would look too black against the white, so I ended up going with the same Minwax stain in *Early American that we had used on our DIY Window Valance, which turned out to be the perfect not-too-dark, not-too-light colour. (*affiliate link – for more information read our disclosure policy). And that’s it my friends! I told you there was nothing to it! 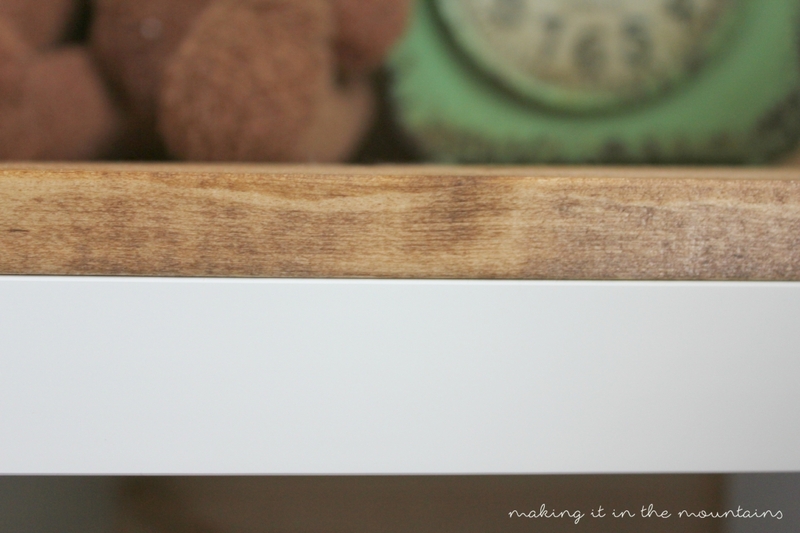 I’m SO happy with how it turned out that I’m seriously thinking about wrapping all of our IKEA shelves in wood now! 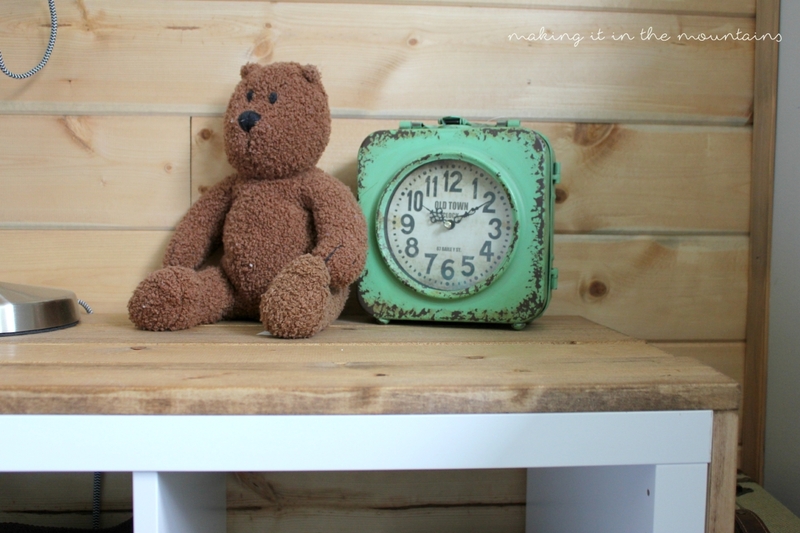 I absolutely love the character it adds to a plain and simple shelf that everybody seems to have!!! 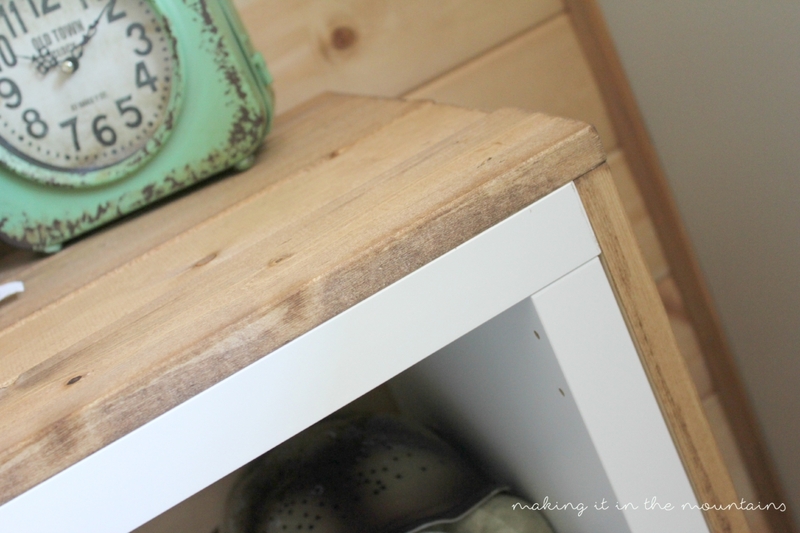 And who doesn’t love a good, simple IKEA Hack !!! Don’t forget to check it out in the room! 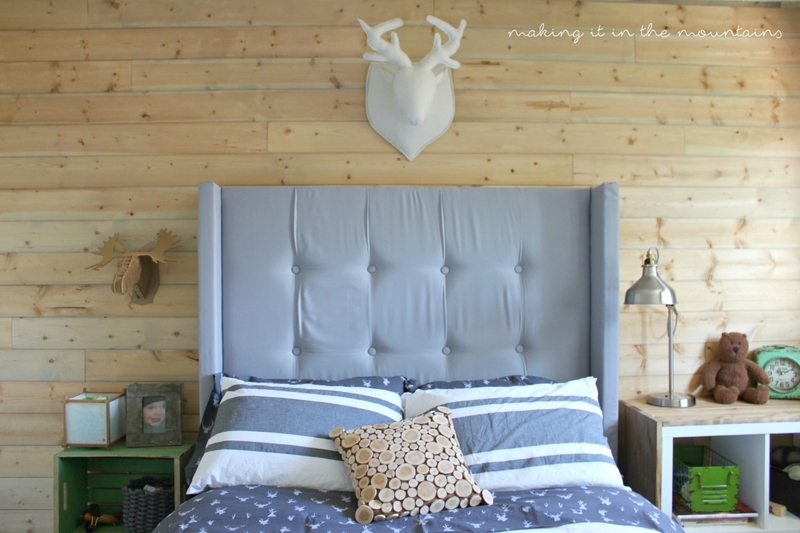 And if you’d like to check out our latest ORC makeover, pop on over to our Farmhouse Master Bedroom! 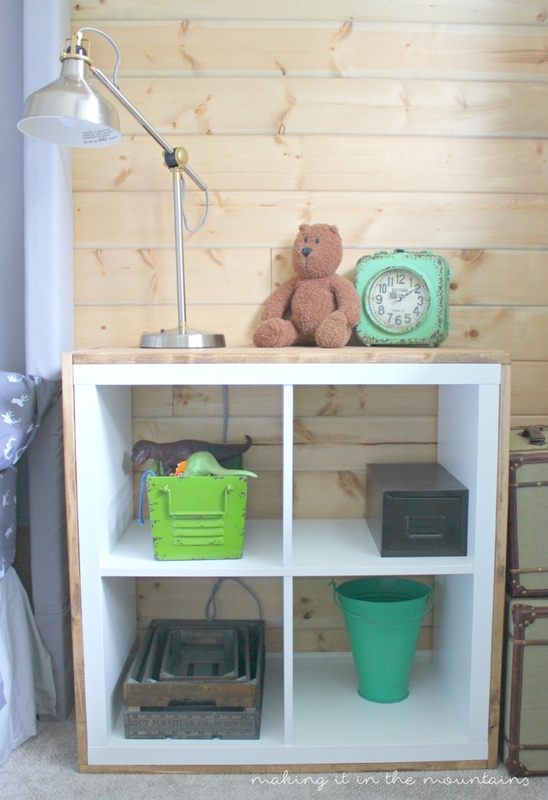 Have you DIY’d any IKEA Hacks lately?! I’d love to hear about them in the comments below!! Wishing you SUCH a lovely day! Such an easy upgrade!! Love it! Love Kristi, love this hack! Brilliant!